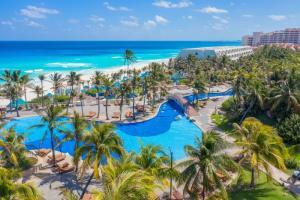 This upscale all-inclusive resort is located on the Grand Oasis Cancun property, so guests may enjoy everything it has to offer in addition to all the exclusive privileges of being a Pyramid guest; like upgraded room amenities, exclusive top-ranked restaurants and bars, and a private beach club. The Pyramid at Grand Cancun boasts the ultimate entertainment in Cancun, including Vegas-style aerial acrobatic shows, DJs at the Oasis Beach Club, live musicians and bands, themed parties and more. This resort complex also boasts Cancun’s only casino in a resort, the full service Red Circus at Grand Oasis Cancun, open 24 hours.